The more powerful phones get the more you can do with them while on the go. From browsing the Internet to using cool features such as GPS to listening to music or watching multimedia contents. Depending on how you use your phone, it may drain battery rather quickly, and even if you are careful about the phone's battery consumption, it may use more battery than you'd like it to. One thing that you can do to monitor and optimize your phone's battery consumption is to use a battery diagnosing app like Battery Doctor which helps you get the most out of each battery charge. 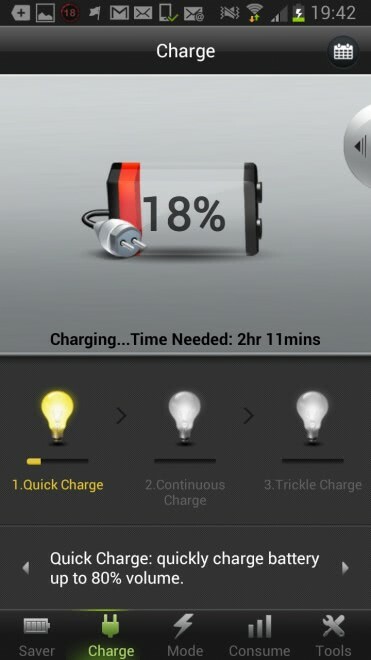 Battery Doctor launches the Saver tab by default which gives you a visual indicator of the remaining juice you have available. It displays that as a percentage value and in hours and minutes you have left before the phone runs out of power. Below that are core features of the phone like WiFi, Sync or Brightness that you can turn on or off easily here. For each item listed here, Battery Doctor lists the approximate time you can extend the phone's battery capabilities with if you turn the feature off. Turning off Wifi for instance would increase my phone's current battery status by 90 minutes, while turning off sound to mute would extend it another 30 minutes. The time you see listed here correlated directly to the current battery status of the phone, so if your phone is nearly drained you will gain less time when you turn off features than for a fully charged phone. The charge tab rates your charging habits and provides you with information about the charging types available to you. A quick charge for instance quickly charges the battery to up to 80% of its capacities. The phone rates your charging habits and gives you tips on how to improve them further. Here you can also access your charge records. The third tab mode allows you to quickly switch between different battery saving modes. The application supports an extreme mode which is an ultra-low battery mode, a clock mode which only keeps the alarm clock on and a custom mode that is using custom settings. A tap on each mode displays what is enabled and what is not when a mode is switched to. Among the features that you can modify are the screen brightness, connectivity features, sync or vibration. The consume tab provides you with information about which app or service is using the most power. It is similar in regard to Android's internal power consumption list. 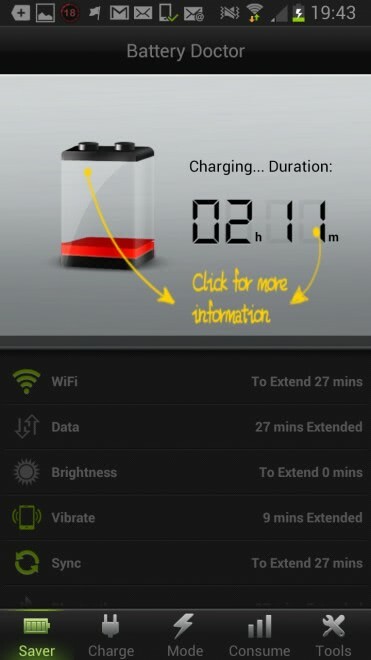 The application displays a small green battery level indicator in the phone's notification area on top so that you always know on first glance how much battery there is left before you need to charge it. Battery Doctor is a helpful application for Android devices to get the most out of each battery cycle. The tips and options to turn off a feature with a single tap make it interesting, as do the three power modes it ships with. The app is available freely, it ships without ads, and there is no pro version with advanced functionality at the time of review. Me low tech. Me just carry spare battery. So how many of them are you carrying around with you on a given day? I carry just one battery as an emergency backup. My phone usually lasts through 10 hours with book reading and browsing during the day. And of course email and phone calls. When I travel, I usually carry 2 plus a solar/AAA battery powered recharger. I got me a clunker: Note 2. I’m a primate, I still like to use a stylus instead of my pudgy fingers. I’ve done some research on Li-ion batteries. Turns out, the worst thing you can do is let the battery drain completely dead. This can damage the negative electrode on the battery, reducing it’s performance. The battery favors the 40-60% charge range. That is it’s most comfortable charge status. Over charging or keeping the battery in a fully charged state for long periods can cause the metallic lithium to crystalize, reducing capacity and performance. Also, battery life for Li-ion batteries is expressed in charging cycles. They are considered to have x number of charge cycles before they begin to fail. Charging the battery while the phone is turned on confuses the battery’s memory for charging cycles and could cause reduce battery life. Fast charging the battery generates excessive heat and can damage the battery. Most batteries are affected by excessive heat during charging. Li-ion batteries are particularly susceptible to excessive heat issues. So, beware. The effect these things have on your battery can depend on various circumstances. But, its good to be aware of them. Also people need to understand about milliamps and amps when it comes to chargers. My phone is a Samsung Galaxy class phone and the included charger is a 1A charger, which is a fast charger. I had another phone which outputs 700mA, and use that to charge my phone instead of the included charger. It takes about 40 mins longer to use the 700mA charger. Older USB ports on computers output 500mA which is the best way to charge a portable device because it is low enough to not burn out the battery life and high enough to still be a decent time to charge (for me 4hrs with the phone on and only 2hrs with the phone off). The original 1A charger takes 2hrs with the phone on and only 1hrs with the phone off. I specified older computer because newer computers with the device charge circuit keep the voltage and amp on at peek even if the computer is off or in standby mode. Battery Doctor looks like a very well engineered battery saver app. Thanks for the review. Have been using this app for several weeks now and have noticed a definite improvement over other battery saver apps I have tried. which gives me enough power for a day. But beware that the battery is twice the weight of the OEM version, so the phone is heavier. This bothered me at first but I got used to it. I used so many battery saver apps in the past on my android phone but this one is awesome. @DanTe: funny you mentioned a Solar battery charger. I just bought one for my phone, It has an internal 5000mAh battery and only takes 10 hrs in full sun to charge the internal battery. I’ve already tested it: it can charge my phone (1950mAh battery) to full 2.5 times prior to needing a charge itself. This inspired me to install battery doctor on my mobile. Let’s see how it enhances battery life. I have this app on my phone. Can anyone help me activate battery doctor while charging? It’s advising me to activate it whenever I charge. While charging your tablet or phone, turn the device on and open Battery Doctor until charging is finished. I was using the battery doctor and I turned off all the sound on my nook. Can somebody please tell me what I need to do to turn the sound back on? I was in the Mode area of the battery doctor when I turned the sound off by accident. I could really use some help please. Battery Saver HD – Battery saver, energy optimization and task killer to save battery. Guys…… I have an Galaxy S2….. My phone did not last a day!!! After battery doctor was installed, I still had power left even after I got home! Also…. rooting helps. (CPU) saves. And make sure to change the settings like close apps when screen is locked. And make sure no apps start on boot up. And clear the ignore apps from cleaning. Like Facebook and whatsapp runs in the backround the whole time….. so you dont use it all the time?? Only open it when you want to use it.